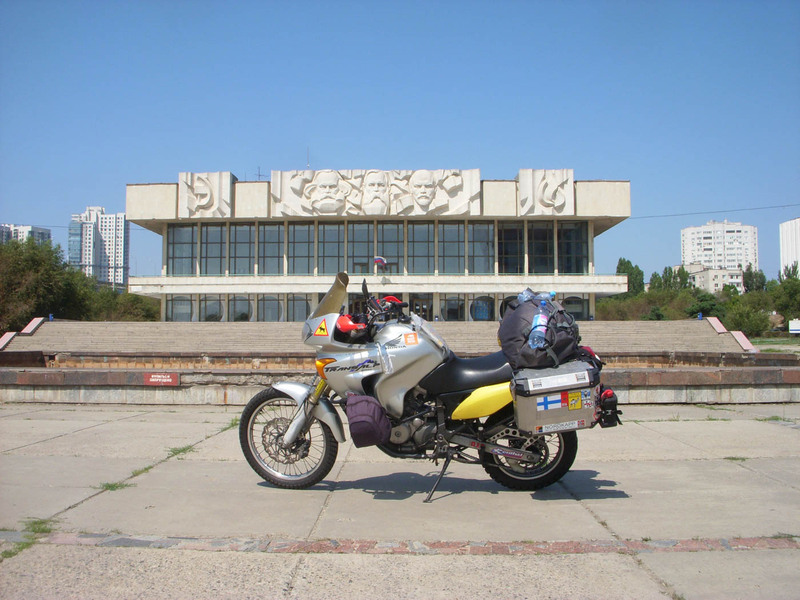 With my historic and beloved Transalp 650 I left Italy at the end of July and quickly crossed through Austria, the Czech Republic and Poland.When I arrived in Belarus, I noticed my surroundings change as I left behind me the "wealth" and the typical Western Europe that I know. In every period of our lives we feel inspired and fascinated by either something, someone or some place in particular. Actors are allowed to take on different roles and the common man can live out his own “movie” through the magic offered by travel.It happened to me in 2016: I felt a bit like Marco Polo, perhaps because I was born in Venice. 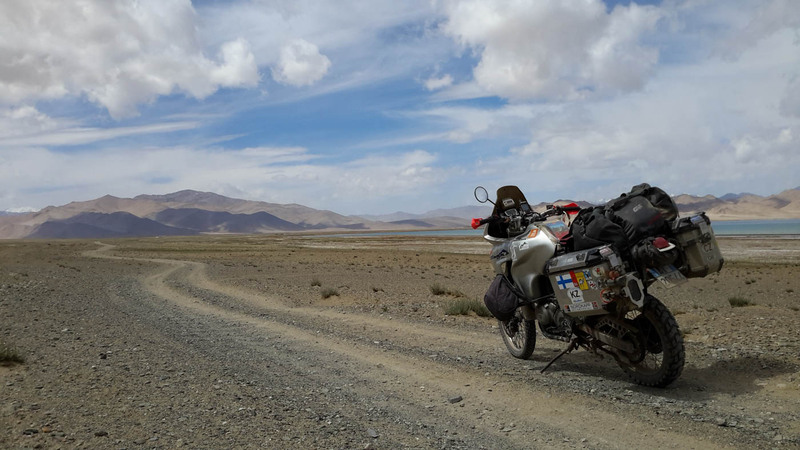 I decided to embark on a journey along the ancient Silk Road through Mother Russia and then Kazakhstan, Uzbekistan, Tajikistan and Kyrgyzstan.Organising this adventure was neither easy nor quick: the Southern route which was initially chosen would have led me across Turkey, Iran and Turkmenistan. 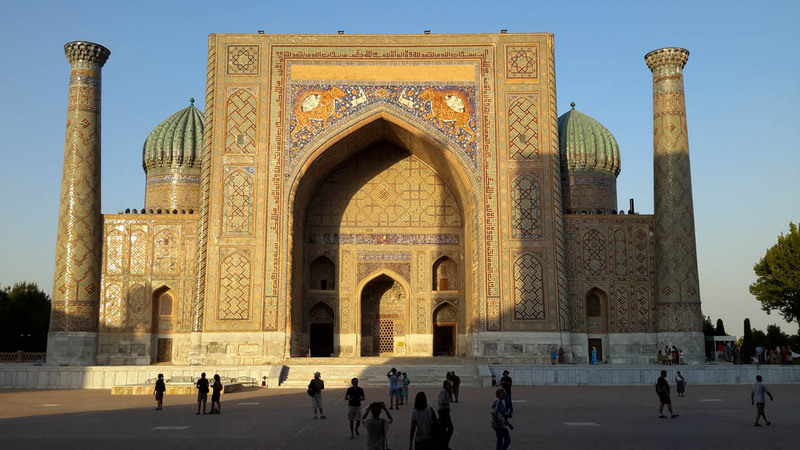 The bureaucratic difficulties and the lengthy processes associated with obtaining the Turkmen Visa forced me to head via the North, through Mother Russia. 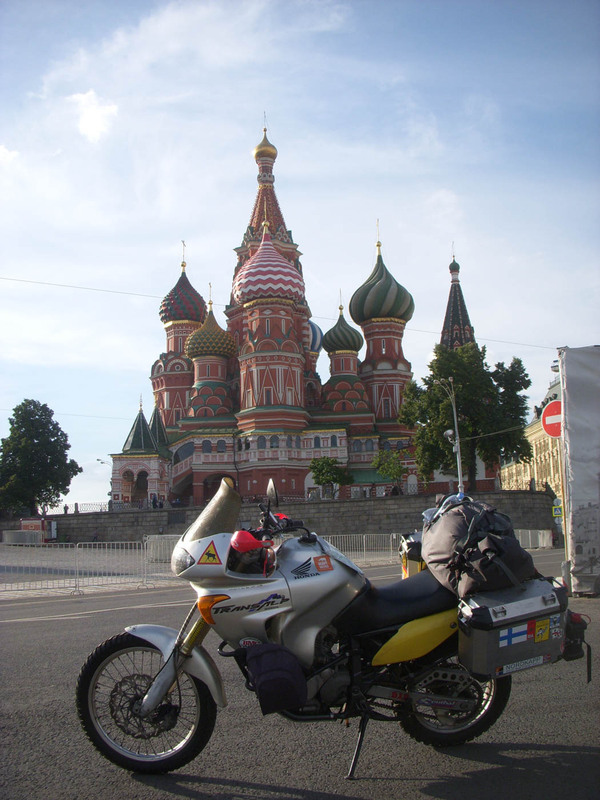 With my historic and beloved Transalp 650 I left Italy at the end of July and quickly crossed through Austria, the Czech Republic and Poland.When I arrived in Belarus, I noticed my surroundings change as I left behind me the “wealth” and the typical Western Europe that I know. Entering Belarus made me feel part of a postcard that I had seen plenty of times in magazines and on television. Some clapped-out old vehicles including the typical Soviet-style cars accompanied me along a road dotted with signs written exclusively in Cyrillic. 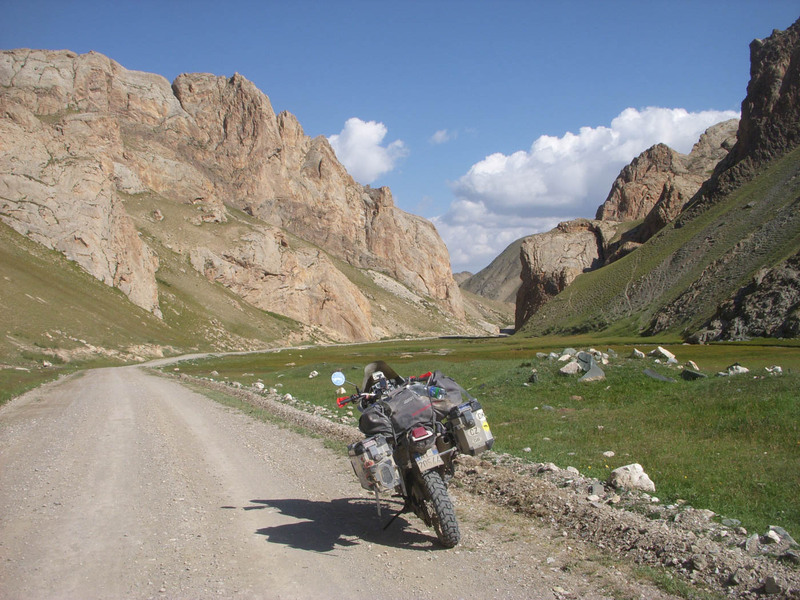 My route was taking me to Moscow and then south into Central Asia. I spent the night at the home of an elderly lady and I left early the next morning so I could cover a good number of miles during the day. 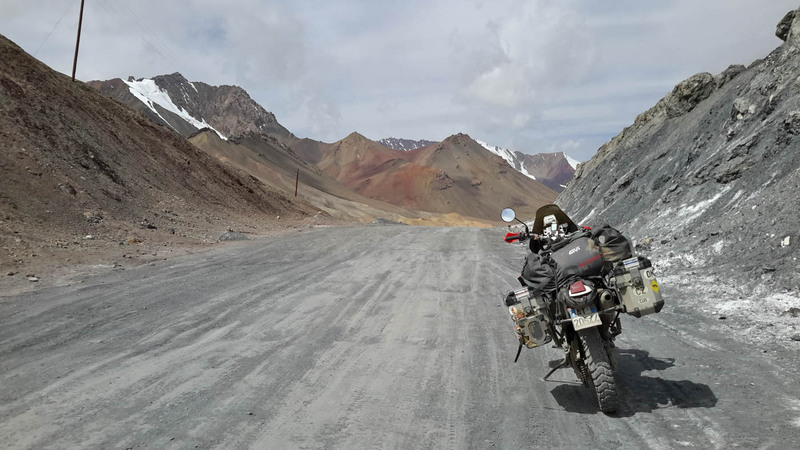 It was a fast road with a good surface and on either side there were vast lands of cultivated fields; villages along the route are characterised by monuments that celebrate either the Soviet victory in the Great Patriotic War or the Second World War. That afternoon I arrived in Moscow, where I visited the Basilica of St. Basil and Red Square.During the next few days, the southward route took me to Volgograd (formerly Stalingrad) and from there, I rode to Astrachan, crossing the Volga Delta and then entering Kazakhstan.In the meantime, the landscape changed again and the cultivated fields were replaced with large areas of flat grassland (steppe) and then the desert. 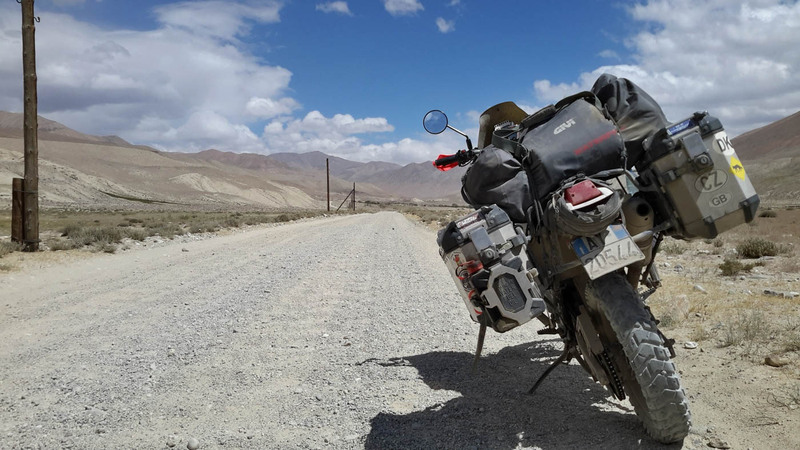 I found the streets of Kazakh to be literally “demolished” and I had to ride carefully along a road covered with real holes. 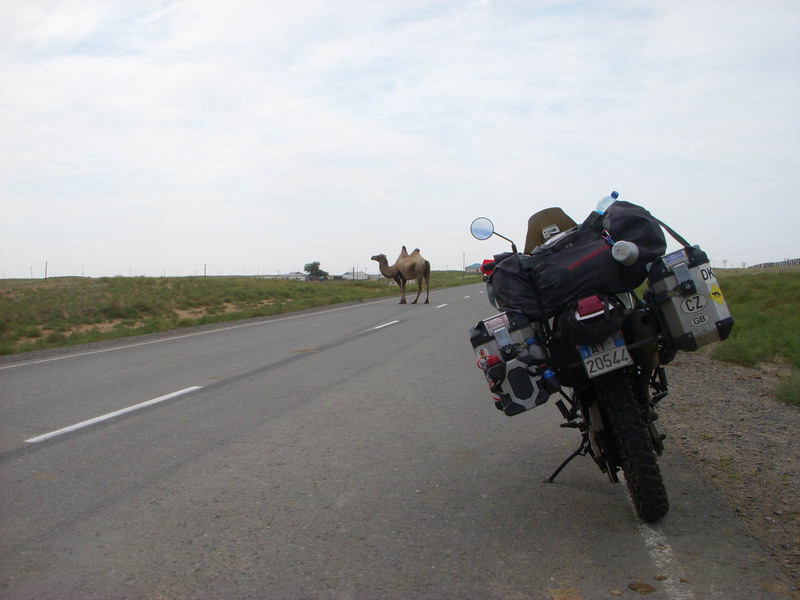 I saw camels slowly crossing the road and one simply stopped eating, raised his head and looked up at me.At Beyneu the road ended and became a track all the way to the border with Uzbekistan.After entering Uzbekistan I continued to Khiva, an ancient crossroads of exchange along the Silk Road. 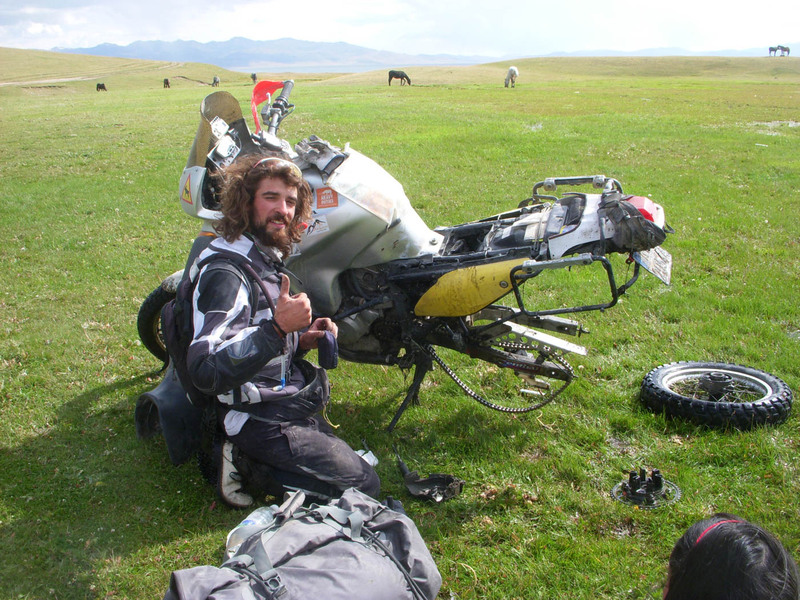 I experienced great difficulties in finding fuel for my motorcycle. In this country, cars use propane gas so petrol is hard to find and in some places, petrol pumps have been completely removed. I managed to fill my tank by relying on the Black Market, where fuel was being sold at European prices.Thanks to complications at Customs and the search for petrol, night fell before I had a chance to find accommodation and I found myself riding in complete darkness along a crowded road, with animals crossing repeatedly, not to mention cars and carriages and none of the vehicles had lights.I found a bed, lodging with a family who ran a tea house and I was finally able to rest for a few hours.During the following days I visited Khiva, Bukhara and the most famous Samarcanda.All beautiful cities and each featuring fascinating monuments and extraordinary architecture.Khiva appeared to be the most well preserved and authentic with large, ancient walls that defend the city. 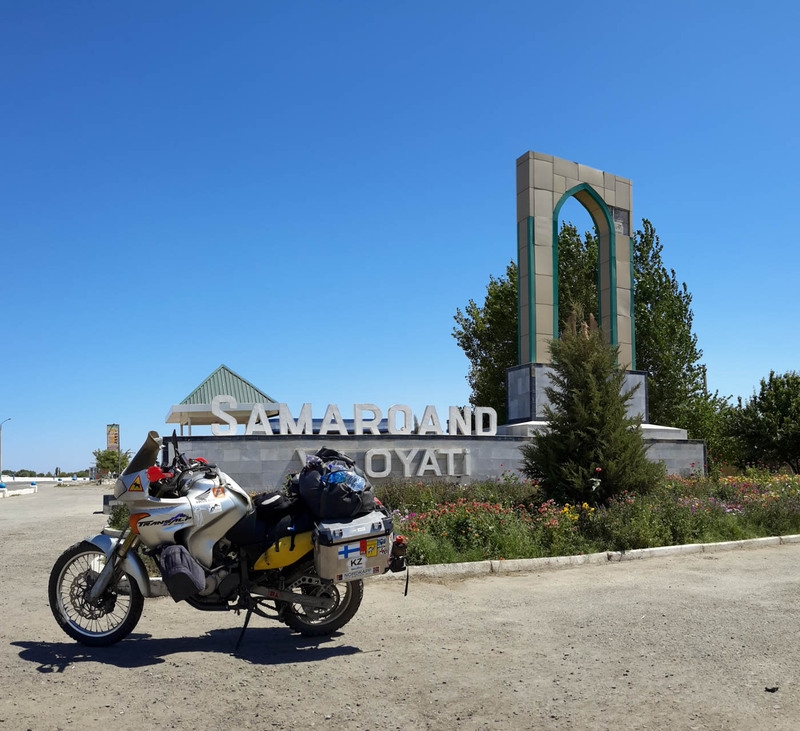 Bukhara struck me with its squares and fountains and finally there is the legendary Samarcanda, one of the oldest cities in the world and the city that benefitted the most commercially during the time of the Silk Road. In 2001 Samarcanda was declared a UNESCO World Heritage Site.After spending a few days as a tourist I travelled to Tajikistan, a beautiful nation that borders the fascinating and ravaged Afghanistan.The roads in Pamir reach over 4,600 meters in altitude, like the AK-BAJTAL PASS.The scenery is fantastic: mountains of over 7,000 meters surrounded me in the Wakhan Corridor. 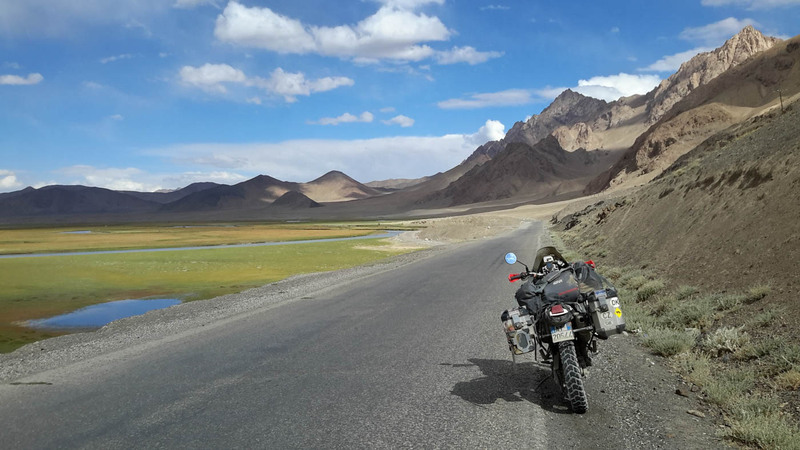 I rode along with the Panji River on the right and the Hindu Kush Afghan Mountains on my left.I reached out to greet many peasants at work in the fields and they responded timidly with their hands. 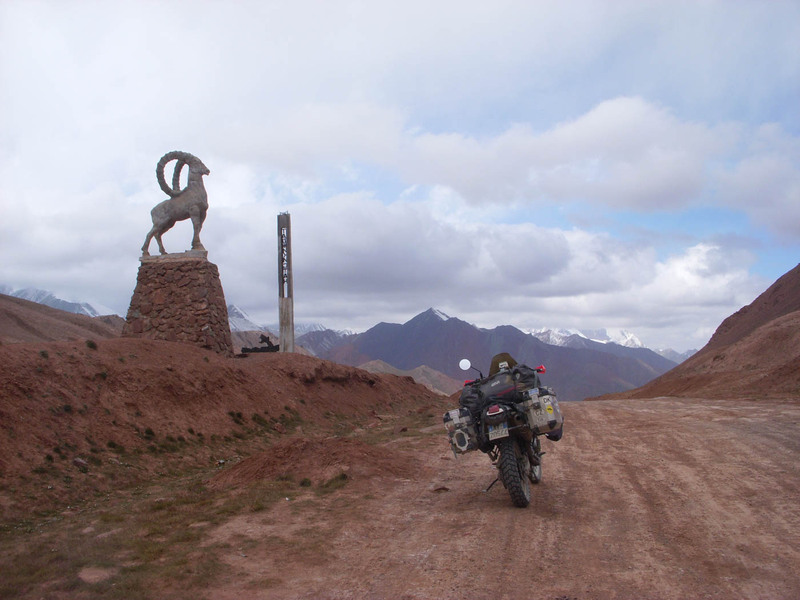 My “expedition” ended in Kyrgyzstan.The impact of this country was powerful. 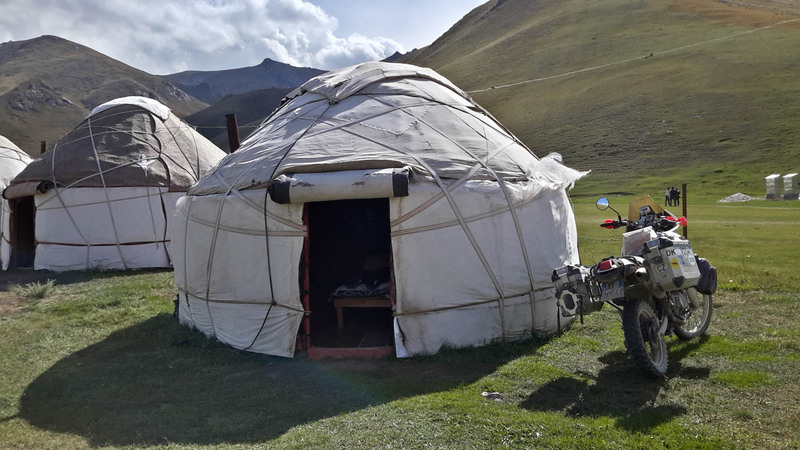 I thought I had been catapulted into Mongolia with yurt camps of shepherds in mountain valleys and almond shaped eyes typical of the Mongolian people … I remained fascinated by the Tash Rabat caravanserai (roadside inn) found along the road to the Torugart Pass leading to China. I crossed a border made from wooden trellises and barbed wire, a legacy of past ages. After traveling for a whole month, I finally entered Bishkek, the capital of Kyrgyz. Here I separated from my Transalp, which I entrusted to a freight forwarder. We were to meet again at home. 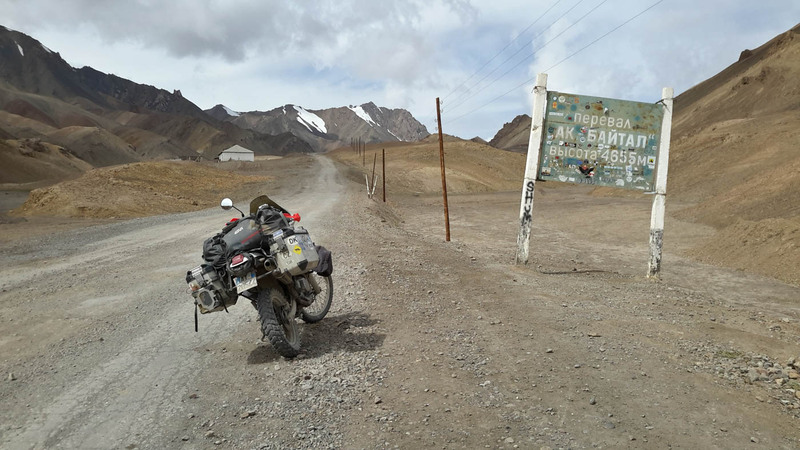 On this journey I travelled approximately 10,000km, I met humble and friendly people, all eager to get to know my world; I saw places that still fill my eyes, I lived for days at an altitude of over 3,000 meters, reaching 5,000m. 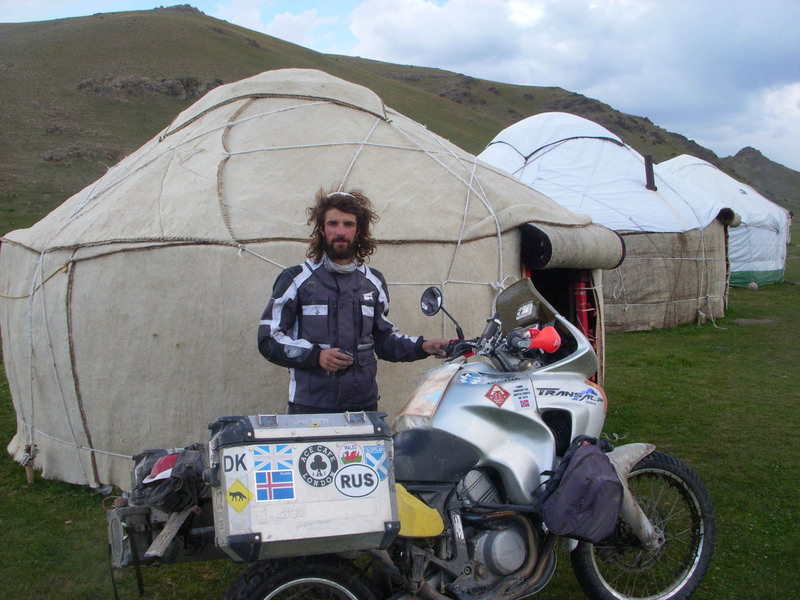 I used gasoline at 80 octane and I encountered the bureaucracy and corruption of the former Soviet Union.I learned to overcome unpredictable situations and became a more experienced traveller. 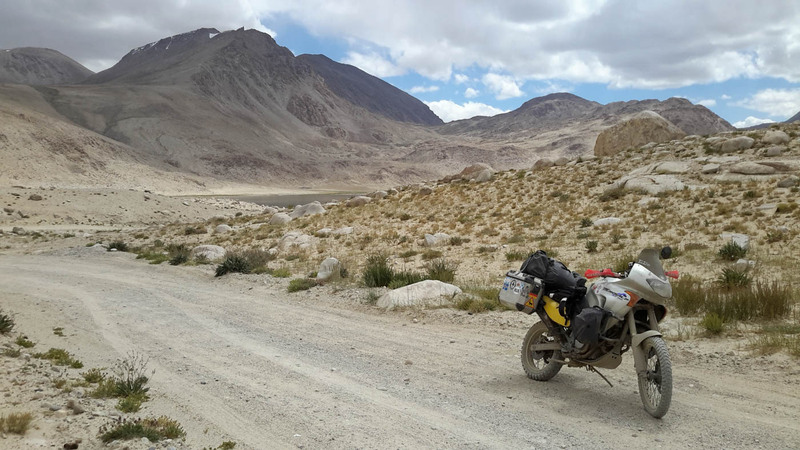 The motorcycle behaved extremely well and the luggage and various GIVI accessories proved to be invaluable. 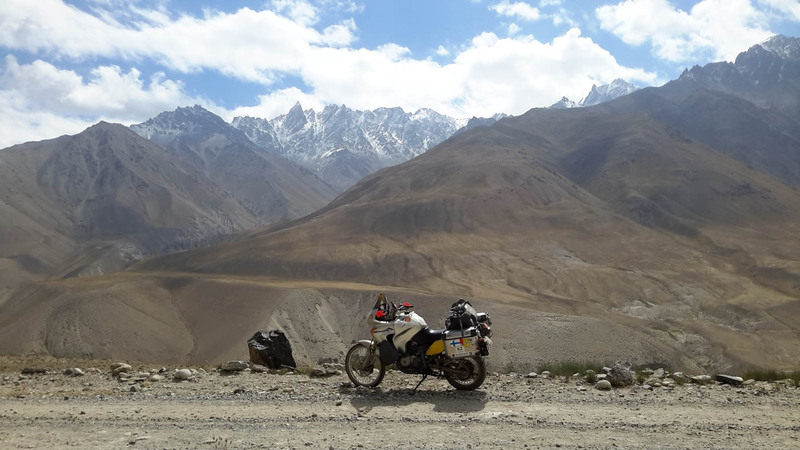 ACCOMODATION AND MEALS: I mostly slept in small family-run guest houses or back-packer facilities. Prices were cheap and always included breakfast and several times the price paid also included dinner.I often found myself to be the only guest, a privilege that allowed me to interact with the host family.